Slickum Falls are an example of a rare ecological community, something known as a cataract bog. Cataract bogs form where a permanent stream flows slowly over a steeply sloped rock outcrop. A thin layer of soil forms on the edges of the stream's flow, and this moist soil supports a number of rare plant species to create the bog. In stark contract, just yards from the stream are two dry habitat plants - lichen and prickly pear cactus. These falls are in the Eva Russell Chandler Heritage Preserve, managed by the S.C. Department of Natural Resources, in the Mountain Bridge Wilderness area between Ceasars Head and Jones Gap. In the top photo, I have pieced together several photos to create a panoramic image of the falls. Below that is a closer look at one portion of the falls. I estimate Slickum Falls drop 100 feet in elevation over a run of 150 yards down the outcrop. Below is a shot of the fern-lined trail leading to the falls. Directions: The falls are in the Eva Russell Chandler Heritage Preserve. You can access the preserve on graveled Persimmon Ridge Road. Shortest access to this road is between Bald Rock and Ceasars Head on US 276. The road is the first on the right past Bald Rock. Parking for the preserve is .5 mile down this road. Walk behind the gate and follow the trail where it turns to the left off of the old roadbed. 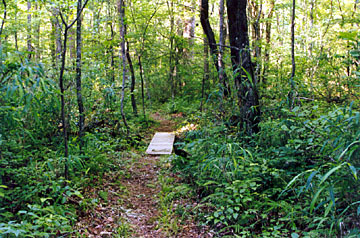 The easy-to-follow .5-mile trail forms a loop passing through hardwoods to the granite outcrop then following the creek upstream through a fern-filled floodplain and emerging onto Persimmon Ridge Road below the parking area. The .5-mile trail begins 100 yards down the road from the parking area at a sign. Please be careful to protect yourself and the preserve. The rock outcrop is extremely slick, and the preserve protects these unique, rare and fragile plant species for a reason.